Giac Lam is one of the oldest pagodas in Ho Chi Minh City. 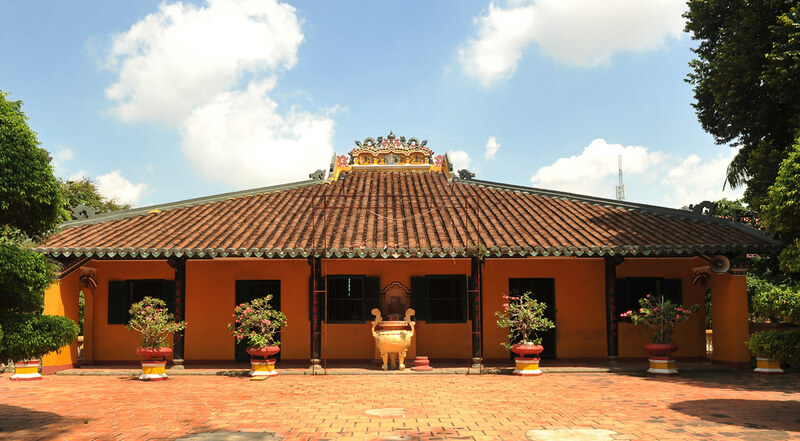 Originally, it was built by Ly Thuy Long – a native Minh Huong, in 1744, as a gathering place during Lunar New Year. The new-built temple was like a scenic lookout overlooking Gia Dinh Market while the area was still undeveloped and quite like a jungle. The name Giac Lam was given to the pagoda after the arrival of Monk Thich Lam Quang of the Lam Te Zen lineage, in 1772. After many times of renovation and reconstruction, it’s now located at 118 Lac Long Quan Street, Tan Binh District. Local people also call it Cam Son, Son Can Pagoda or Cam Dien Pagoda. This large and sprawling establishment houses beautifully rendered images of Buddha in various incarnations, along with numerous Taoist deities, each with own altar. All the wooden pillars are decorated with red-and-gold Chinese characters. “The Third” structure of Giac Lam Pagoda is also typical of southern pagodas. It means the pagoda consists of 3 main buildings: the main ceremonial hall, the dharma preaching hall and the meal hall. The first one is big with many huge pillars engraved with meaningful sentences. It worships many Buddhas such as Buddha Amitabha, Buddha Shakyamuni and some Bodhisattva like Maitreya Bodhisattva, Samantabhadra Bodhisattva and Avalokiteshvara Bodhisattva. The ceremonial hall is dominated by the large statue of Amitabha Buddha, who is surrounded by five smaller Buddha images. Also in the main hall is the ‘nine dragon altar’ depicting the birth of Prince Sidharta, the future Buddha Gotama. Giac Lam Pagoda has 118 statues made of wood, bronze and cement. Most of them are very ancient and valuable, which demonstrate the development of Vietnamese art of sculpture in 18th century. Not only is Giac Lam a place to observe traditional southern structure of pagodas, but it’s also where tourists can discover the specific cultural characteristics of Vietnam, like the 4-season fruit pattern. The special highlight of the pagoda is the complex of towers built in the early 19th century. The pagoda currently retains 38 multi-sized towers. Most of the towers are built based on the architectural style of the ethnic groups living in the South such as Khmer, Vietnamese or Cham... in combination with some Western elements (France) and the Oriental (China, India) to beautify its uniqueness and perfection. These towers are the most vivid witness for the development of Buddhism in the South over time. 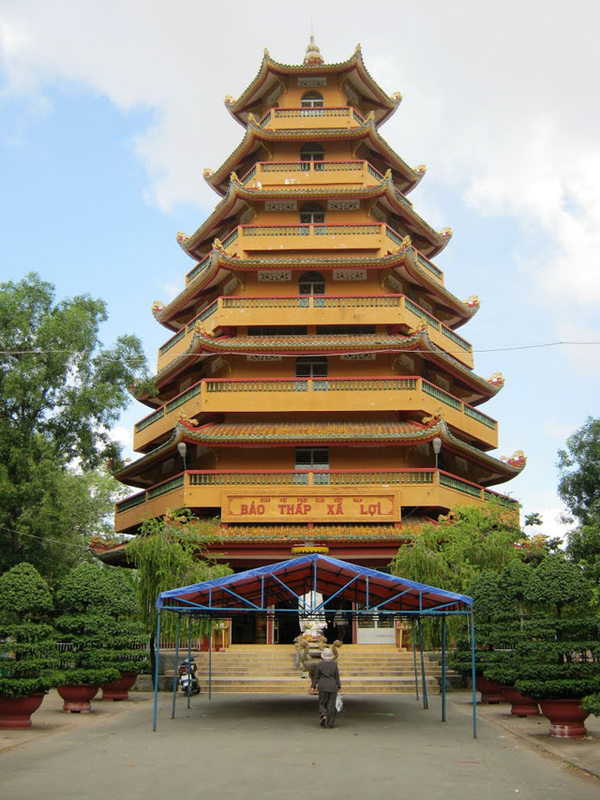 Discovering Giac Lam Pagoda is definitely one of the most things to do in Ho Chi Minh City. In front of the pagoda is a big bodhi tree, a gift from Sri Lankan great monk Narada in 1953, accompanied by the arrival of a sample of the relics of Gautama Buddha. With the purpose to store these relics, a seven-storey high stupa was started building in 1970 under the architectural plans of Vinh Hoang. Due to wars, the construction was put off and could only finish in 1993. Today, the east-facing, hexagonal-shaped stupa is considered as a landmark, being the tallest Buddhist tower in the city. Situated in Binh Than District, the pagoda is surrounded by spacious, walled garden and fronted by statues of mythical dragons, the protective guardians to many temples here. Inside, this richly decorated shrine is comprised of three areas: the ceremonial hall, the chanting hall and the refectory.